Three generations of the Agnew family are working together this Expo as the family has for the past 30 years. L to R: Darrin Gregory, Katie Agnew, Tom and Keely Agnew and their children, Bryn and Blake. Since 1978, Mapleton Valley Farms have exhibited their Milking Shorthorn cattle at the World Dairy Expo. 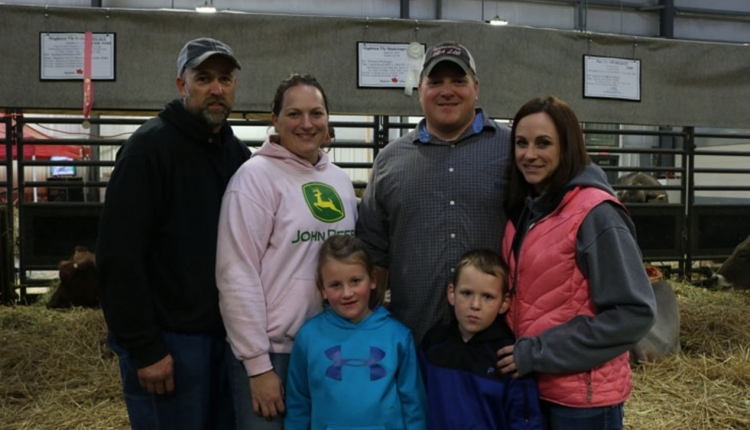 Pat and Phyllis Agnew with their two children, Katie and her husband, Darin Gregory; Tom and his wife, Keely; and Tom’s two children, Bryn and Blake, have all been in attendance at this year’s World Dairy Expo. It all started when Phyllis Agnew, then Gerner, began showing here with her parents, Willard and Sylvia. She now shares the same excitement for Expo with her children and grandchildren. Katie is in charge of washing, while her brother Tom takes care of bedding. Mapleton Valley Farms is only an hour away, in Oconomowoc, Wis., so Pat and Phyllis take turns staying home to do farm chores. As for the grandchildren, they may be too young to show, but that doesn’t stop them from helping. Tom’s two children are Bryn, who is 7 years old, and Blake, who is 5 years old. They both are excited to start showing and help with watching the cows and keeping the bedding pack clean. “They are always in the barn trying to help out their grandparents and us,” said Katie. All in all, the Agnews enjoy the quality family time spent at Expo and look forward to exhibiting here for another 30 years.